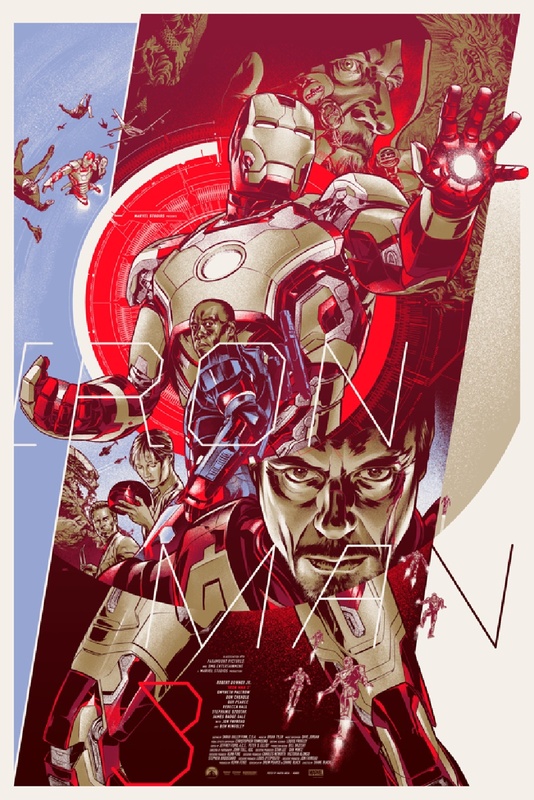 Three very cool looking pieces of new poster art have been released for Shane Black's Iron Man 3. The first poster above is the wrap poster for the movie, which is what the cast and crew received when they were done shooting the film. There's no word on whom the artist is yet, but as you can see, the art style was definitely inspired by the classic covers of the Hardy Boys and Nancy Drew novels. This poster will never be available for purchase. Then below, we've got a couple of Mondo posters for the film! The first one is by Martin Ansin, and the other is a special glow in the dark print by Phantom City Creative. These will go on sale this Friday at a random time. Make sure to follow their Twitter account @MondoNews to find out when the posters go on sale. Martin Ansin, are 24"x36" in diameter with the regular edition limited to 450 pieces and a price tag of $50, while the variant numbers 200 and is $75. Glow-in-the-dark poster by Phantom City Creative that is also 24"x36" and limited to only 250 for $45. IRON MAN 3 - Iron Patriot Character Poster!